In Thailand’s export-oriented economy, manufacturing is the primary driver of economic development and growth. In an effort to remain globally competitive, Thai manufacturers have begun adopting advanced technologies to modernize their production facilities and management strategies. This includes employing SCADA systems for monitoring production equipment to facilitate the shift towards factory automation. However, most factories have limited space for installing new devices. Additionally, production facilities can vary widely in terms of size, environmental conditions, and ease of cabling depending on the products manufactured. Therefore, a successful equipment monitoring system must be sufficiently compact and flexible to allow for installation in diverse factory environments. 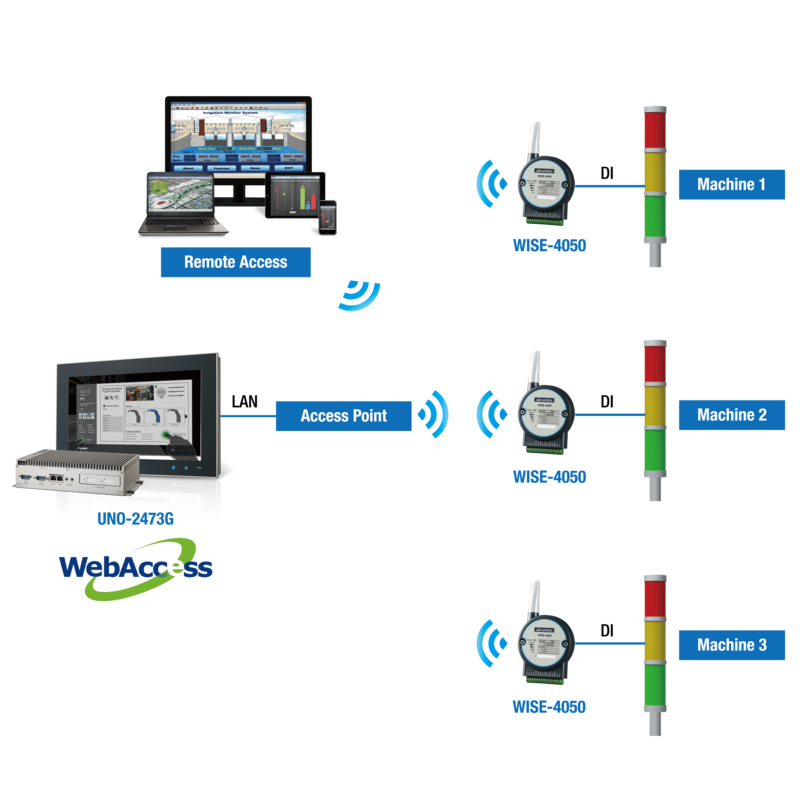 Advantech’s WebAccess platform integrates rugged hardware with powerful software to provide an intelligent wireless monitoring solution. By addressing the challenges of implementation, this solution enables systems integrators to develop innovative systems that can be deployed for various applications without necessitating significant configuration. IBCON Co., Ltd. is an automation systems supplier and systems integrator located in Thailand, with over 20 years of experience in the industrial automation industry. Because most factories in Thailand still conduct machine status monitoring manually, IBCON sought to assist manufacturers with improving management efficiency by developing an equipment monitoring system capable of automatic data collection. However, to reduce the overall development time, IBCON wanted an off-the-shelf SCADA-based solution-ready platform with integrated hardware and software. Additionally, the solution hardware needed to include wireless I/O modules for collecting machine data based on the indicator light color in order to minimize wiring and streamline installation. A compact yet durable industrial computer was also required to serve as a gateway for transmitting data to the back-end control room. Regarding software, Advantech’s WebAccess/SCADA platform needed to offer various tools for application development and support remote monitoring and recording of machine data, remote data access, regular data reports, and real-time alarm notifications. Advantech integrated its WISE-4050 wireless I/O modules, UNO-2473G embedded automation computer, and WebAccess/SCADA browser-based software to provide a solution platform that was easy to develop, configure, and deploy. Using this platform, IBCON was able to quickly design an innovative and cost-effective factory equipment monitoring system. Advantech’s WISE-4050 features 4 digital input channels and 4 digital output channels and is currently the only wireless I/O module available on the market. The provision of wireless modules allows systems integrators to easily implement data collection without additional wiring, and enables flexible network expansion and upgrades. The modules also feature a data log function with RTC timestamps to ensure accurate transmissions without data loss. Compared to conventional 4U industrial automation computers, Advantech’s UNO-2473G has a relatively small form factor, reducing the amount of space needed for installation. UNO-2473G also features a ruggedized fanless design, wide operating temperature (-20 ~ 60 °C), and rapid heat dissipation capabilities, making it suitable for operation in harsh industrial environments. Advantech’s WebAccess/SCADA software platform is a 100% web-based solution equipped with rich libraries and development tools for designing unique animated graphics displays, real-time data graphs, and data/alarm log reports. An HTML5-based user interface and an intelligent dashboard are also provided to facilitate cross-platform/cross-browser data analysis for intelligent management functions, such as scheduling control and trend analysis. Because the WebAccess/SCADA platform acts as a web server and can support up to 1,024 client devices without additional licensing, users can access the platform remotely via any browser or mobile device. For IBCON’s factory equipment monitoring system, the WISE-4050 modules were configured to wirelessly collect digital signals from the machine indicator lights and transmit the data to the UNO-2473G computer installed with WebAccess/SCADA software. Managers could then access the machine data from any location and at any time to conduct real-time monitoring and centralized management. Furthermore, in the event of an alarm, the system was configured to automatically notify the appropriate staff. As a long-term partner of Advantech, IBCON has leveraged many Advantech products to develop innovative industrial automation systems over the years. Recently, IBCON has also become a VIP member of Advantech’s WISE-PaaS Alliance in order to collaboratively promote the development of Industry 4.0 in Thailand. For manufacturers and systems integrators, Advantech’s intelligent industrial automation solutions offer substantial development convenience and efficiency by integrating wireless hardware with powerful software to reduce system complexity and streamline installation. To date, IBCON’s factory equipment monitoring system equipped with Advantech’s WebAccess/SCADA software platform has been adopted by a well-known automobile manufacturer and a leading tire manufacturer. Because of the high customer satisfaction these manufacturers have observed since installing the monitoring system, both companies plan to continue using IBCON solutions in the future.